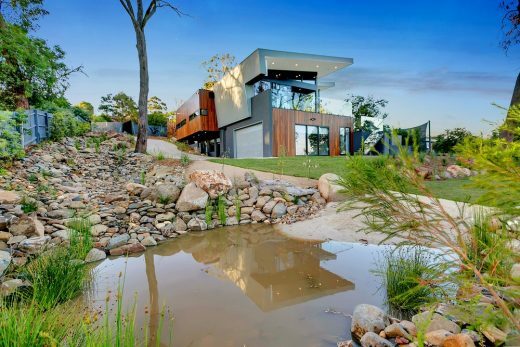 Overlooking the Moorooduc plains sits an impressive new home designed by emerging design company, Little Brick Studio. 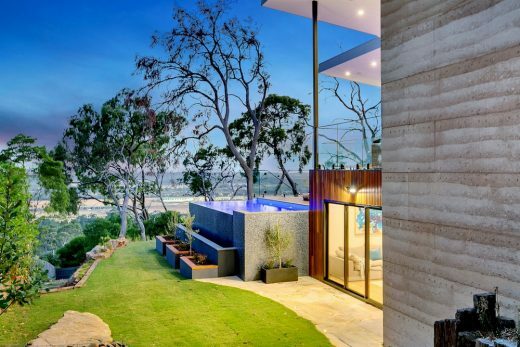 Their design inspiration for the luxury, modern Australian home takes cues from the breathtaking views from the property. 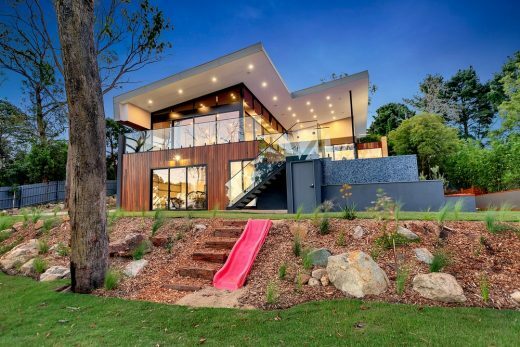 The double-storey residence sits atop the sloping site to use it to full advantage. 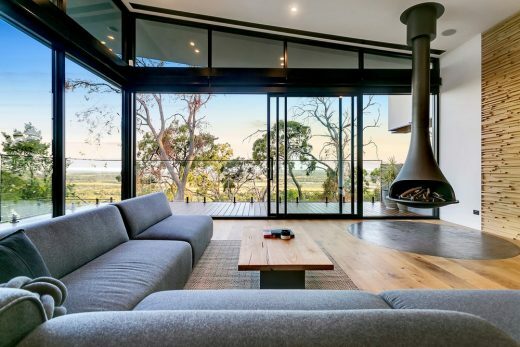 Elevated living areas sit amongst the treetops, creating privacy whilst making the most of those views down over the plains. 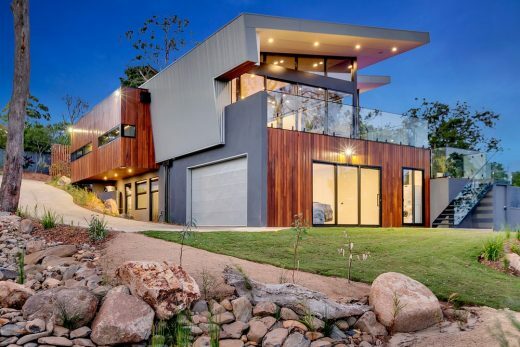 The home’s exterior has rammed earth feature walls in rich organic colours, contrasting with lightweight spotted gum, colorbond cladding and black custom-made aluminium windows produced by Creative Windows to lend a contemporary feel. 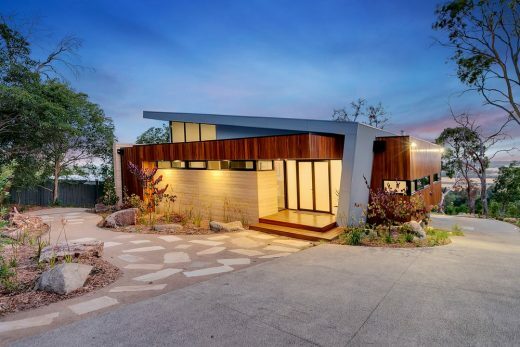 “Choosing the natural elements of soil and timber to create an ongoing connection between the dwelling and its surrounds was the design inspiration – it was important that the dwelling flow with the site, rather than stand out from it,” says Little Brick Studio’s Ben Mulholland. 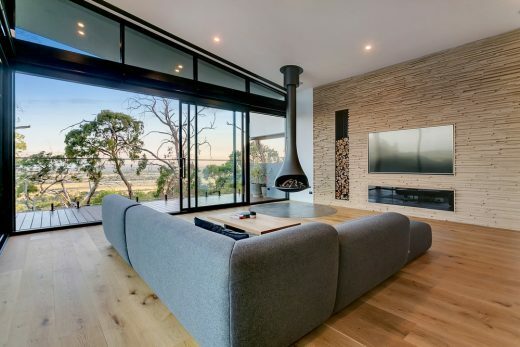 Internally, an understated colour palette and natural tactile materials bring texture and warmth to the home. 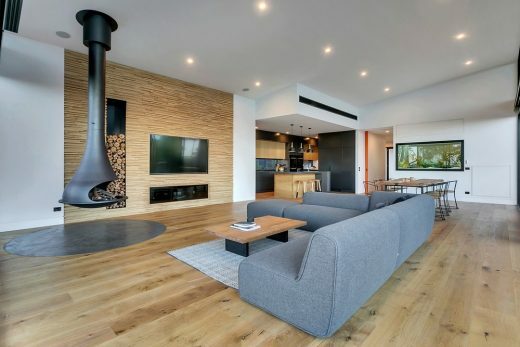 Oak floors complement the timber feature wall in the living room while a pendant fireplace adds mid-century charm. 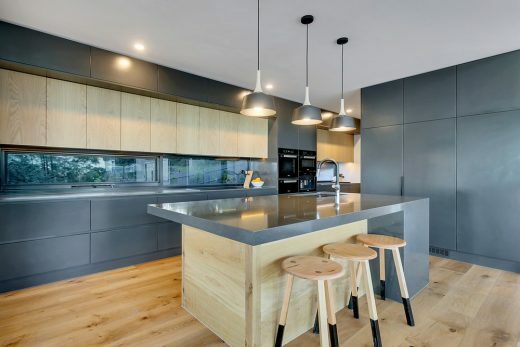 The elegant stripped-back kitchen has timber highlights and sleek matt grey cabinetry. The central island with breakfast bar encloses the space and horizontal splashback windows reveal glimpses of landscape beauty. The open living and dining area with high vaulted ceiling is finished with full-height glazing which opens to the upper outdoor entertaining deck and lower infinity pool all of which take advantage of the views of the plains below. 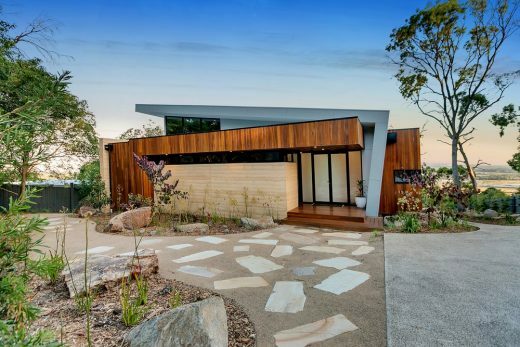 The master bedroom is an opulent retreat with natural oak flooring, a feature reading nook, and rammed earth walled ensuite with freestanding bath by full-height window. Picture windows frame views from the bed right down over the valley, while highlight windows behind the bed and walk in robe provide treetop glimpses. The garage has been placed at the base of the dwelling allowing for the utility and pool service areas to remain hidden and providing direct access to the lower garden. 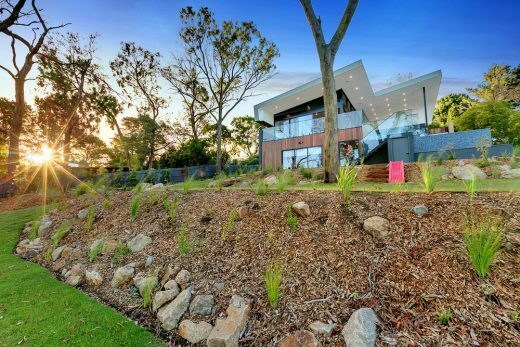 Landscaping features native grasses and plants with existing trees on site protected during the build. 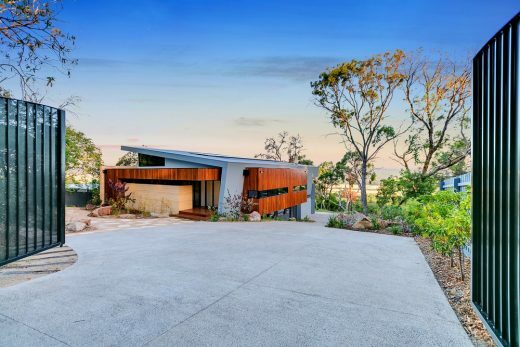 Create a space to live privately amongst the surrounding trees. 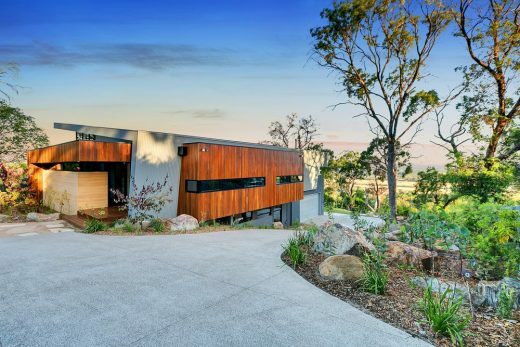 Maximize the views over the valley where there are often wedge tailed eagles playing in the thermals. 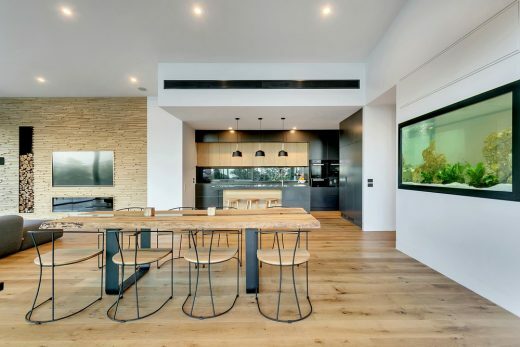 Utilize natural materials to create a unique, modern design. Most importantly shield the building from the surrounding suburbia for a quiet, calm living environment. 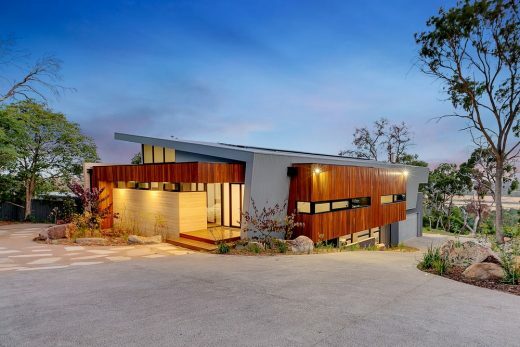 The designer chose to concentrate on the natural elements of soil and timber to create an ongoing connection between the dwelling and its surrounds. 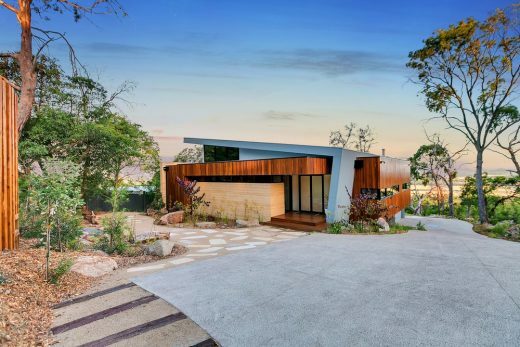 The use of the heavy rammed earth and the contrasting lightness of natural timber elements created a bold presence both inside and out, whilst ensuring that the building blends and flows with the unpretentious surrounds. 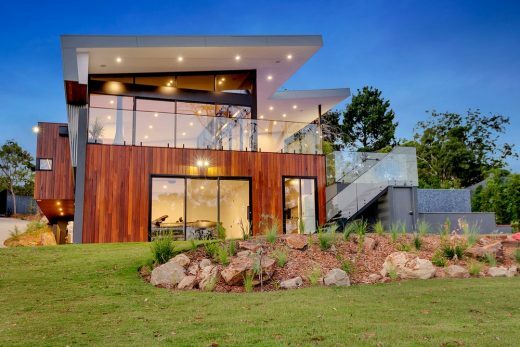 Utilizing the slope to advantage, the living areas were elevated to the top level, creating the privacy the client required, whilst enhancing the views down the slope of the site and over the surrounding plains. 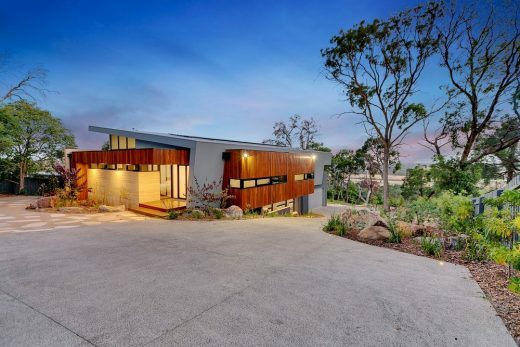 The large residential block in outer suburbia was recently subdivided to include a complex building envelope and conditions to retain existing vegetation, creating harsh constraints on building location and size. 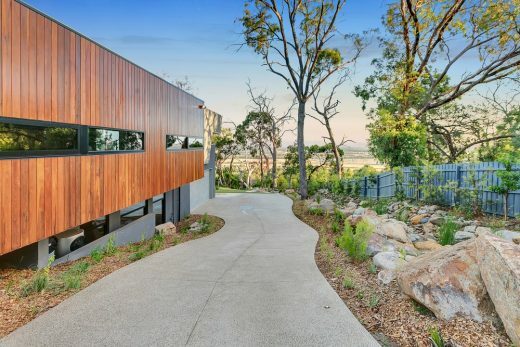 Access to the site and dwelling frontage was the main design challenge due to the long steep incline of the skinny driveway approach and the need for wide open CFA access/turning arrangements at the front of the site. There is also significant slope down towards the lower valley and council imposed height restrictions which created further limitations to the scope of the build.